I have always enjoyed Halloween. Growing up, the fanciful and frivolous imagining of ghosts, ghouls, and things that go bump in the night was a source of immense family fun. My mother would make my brothers and me wonderful costumes to wear and we would go to our church’s “Trunk or Treat”’ or the local “Boo at the Zoo” to gather holiday candy before we even started making the rounds to our neighborhood houses. It is fond memories like these that led me to create my latest work. 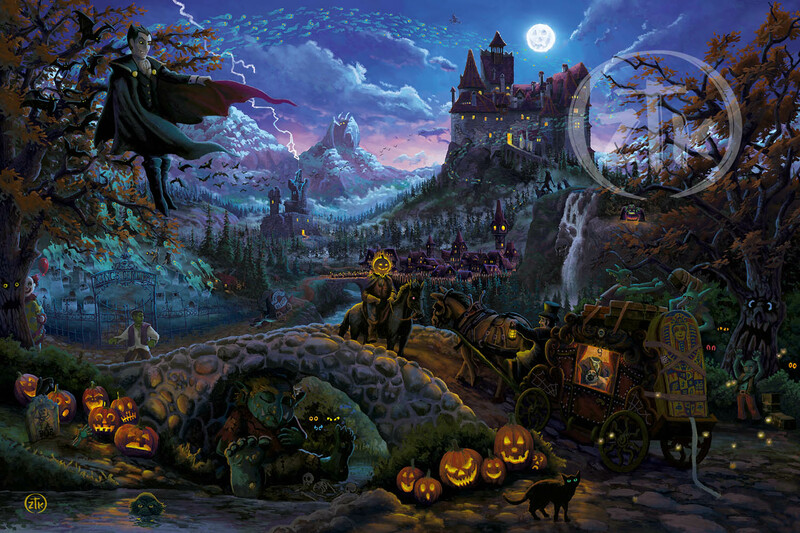 Transylvania is the first in my “Worlds of Wonder” series and a homage to all the great monsters of my childhood Halloween frights. Dracula, Frankenstein, the Werewolf and the Mummy dominate a landscape filled with castles, haunted forests, spooky graveyards and a gathering of villagers ready to rid the land of any troublesome beasties. Beyond these, many more references to our collective popular culture can be found on this canvas. I think you will all enjoy finding the many creatures who pervade the ghostly scenery and discovering who lies resting in “King’s” graveyard. One small detail of personal note that I want all to see is our family dog; “Poe” a nervous pug that barks a good game but who ultimately stands behind us peeking out while protecting our house from assorted Halloween visitors. He sits in the carriage on the Invisible Man’s lap with a wide-eyed peer at everything happening outside. Transylvania begs for exploration by anyone who is stout of heart and of good humor. And, as always, I want to thank you all for sharing my adventure in art… if you dare. This is the first in a new series, Worlds of Wonder. Future paintings may include The North Pole, Camelot, and others. You’ll find classic Halloween characters like Dracula, Frankenstein, the Werewolf and the Mummy. A whimsical troll sleeps under the bridge unaware of the lagoon creature lurking nearby. The little dog sitting in the carriage on the Invisible Man’s lap may look a bit of whimsy but, he’s actually based on a family pet, Poe, a pug, whose bulging eyes make him look like a real-life cartoon. Fourteen carved jack o’lanterns are a nod to the great Halloween tradition of carving pumpkins. King’s Graveyard has numerous ghosts hovering above and is a nod to a great author of horror fiction. Look closely to see if you recognize the famous names engraved on the headstones. The villagers are heading toward the castle, a building inspired by Bram Stoker’s classic book, Frankenstein. Other classic Halloween characters include infamous literary twins, Big Foot, witches, bats, the hunchback, and a creepy clown peeking from behind a tree. Copyright: ©Zachary Thomas Kinkade © 2018 Art Brand Studios, LLC. All rights reserved.